We are often asked what our favourite spots are in East Van. Whether it’s where to go for a coffee, pizza, brunch, romantic dinner, flowers or bakery. In East Van, there are so many amazing options to choose from. So we’ve compiled a list of our favourite places in East Van which we’ve set out below. The list does include a few spots that we haven’t personally made it to, but are ones we’ve heard good things about by many others. We have broken down the listing by the type of listing ie. Coffee, Pizza, Bakeries, Live Music & Entertainment, Breweries & Distilleries. After that you will see it’s listed alphabetically which we hope is logical and easy to use. Are we missing a great spot on this list, let us know. 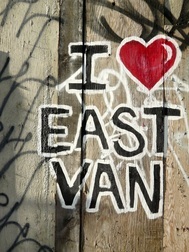 Otherwise, we hope you will check out some of the Places We Love in East Van. The credit for the picture goes to Benee Rubin.